As a result, public health professionals have focused on prevention efforts to change community standards, codes, or attitudes, thereby decreasing the incidence and prevalence of marijuana use in public areas. 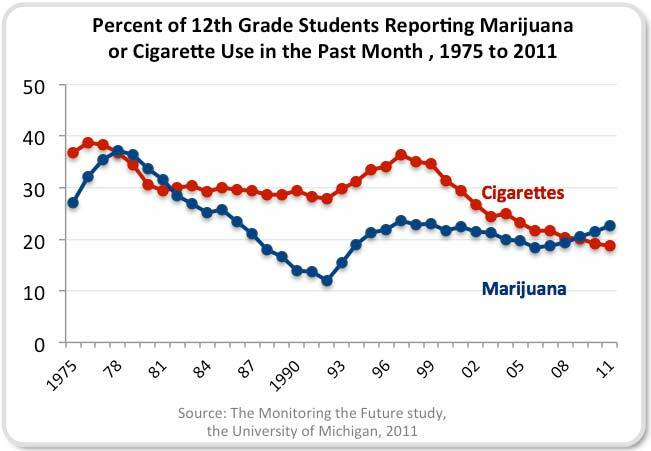 As can be seen in the graph, the prevalence of marijuana use among youth has begun to increase while cigarette use among youth has been decreasing in the past ten years. In 2012 66.9% of 8th graders, 50.9% of 10th graders and 44.1% of 12th graders said there was a great risk in smoking marijuana regularly. These numbers have been steadily declining over the last 6 years. The Teen Brain on Marijuana - a Presentation by Siom kim Karris, PhD. Marijuana use can have significant, long-term effects on the brain development of young people. A copy of a presentation given by Siom Kim Harris, PhD of the Center for Adolescent Substance Abuse Research at Boston Children’s Hospital, can be viewed below or downloaded at right.